In their single-midned insistence on making all of their movies about epic showdowns between the superheroes and some big bad guy, the DC movies have consistently failed at depicting their heroes as having any particular desire or inclination to actually help people. This is perhaps the greatest failing of the Zack Snyder / Henry Cavill Superman movies and the greatest strength of the classic Richard Donner / Christopher Reeve Superman films: Snyder's / Cavill's Superman seems to treat saving people as a begrudging chore that he's obligated to do; whereas the classic Donner / Reeve Superman put on a charming smile and went out there to do good for the sake of doing good, simply because he is capable of doing good. Well now, DC seems to have finally realized that the primary role of its superheroes is to be idealistic saviors and protectors. For the first time in the DCEU movies, our hero shows the idealistic optimism and desire to help people and do good that has been the trademark of the classic Superman films and the Spider-Man films (heck, even Amazing Spider-Man 2 got that right). But in this case, our hero isn't Superman or Spider-Man; our hero is Wonder Woman. I actually don't mind the darker aesthetic and tone that DC has adopted for its movies. The problem so far has been that those movies have been dark and poorly-written and thought-out. Wonder Woman, on the other hand, is a much brighter movie (both in terms of visuals and thematic tone), and benefits from much tighter writing. 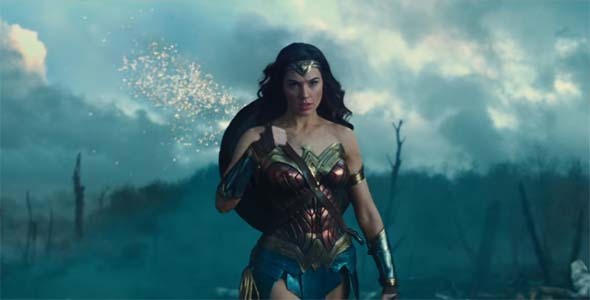 The script is solid and tightly-themed, Wonder Woman has a full and nuanced character arc, the performances are good, the action looks slick, and (most importantly) it's easy to follow along with what's happening. 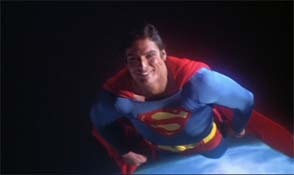 instead of happily doing good for the sake of doing good (as in the Richard Donner / Christopher Reeves Superman). Gal Gadot provides a great performance that proves that her stealing the show in Batman v Superman wasn't just a fluke or a simple sign of how bad the rest of that movie was. She actually works well in this role and is almost as charming a Wonder Woman as Christopher Reeve was at being Superman. The supporting cast mostly works, and this is probably the best role that I've seen for Chris Pine to date. Some of the secondary characters are a bit under-written and lack screen time, but everyone (no matter how minimal their screen-time) has a role to play that helps shape Diana as a character. 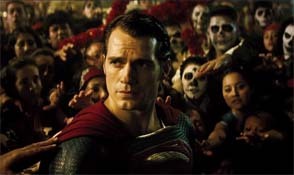 There's no superfluous characters like Louis Lane in either of Snyder's Superman movies. The only exception being, maybe, Steve Trevor's secretary, who actually deserved a lot more screen-time that she received. Even Doctor Poison seemed to have a little bit of complexity and nuance to her character. She does suffer from some poor, underwritten motivation, as the movie never really seemed to go too deep into why she's doing what she's doing. But it's definitely apparent that there's something going on under the surface, beyond simply being manipulated by higher forces. The closest that I could figure is that she has some kind of relationship with General Ludendorff and is blindly loyal to him, but she at least wasn't a bad guy for the sake of being a bad guy. The only major weakness of Wonder Woman, as a movie, is that it's a bit of an uneven work. It's broken down into a readily discernible three-act structure. The first act is great, the second act is okay, and the third act sinks towards the DC stamp of terribleness. The unfortunate thing about this is that I walked out of the theater with a bad taste in my mouth, even though the movie was still mostly pretty good. So far, DC's movies have all started out mediocre and progressed towards terrible by the end. 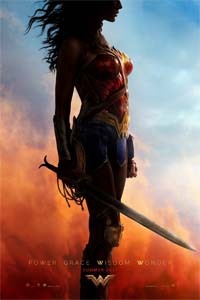 Wonder Woman, however, starts out good and starts to sink in the direction of bad at the very end. Which, I guess is a big improvement. Act II concludes with Wonder Woman getting her first real "hero shot" in the movie. 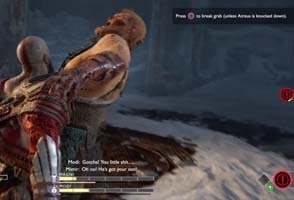 Before we get very far into this, I want to acknowledge a point that you might be thinking right now: "But MegaBearsFan, Yorshka tells us who her parents are!" 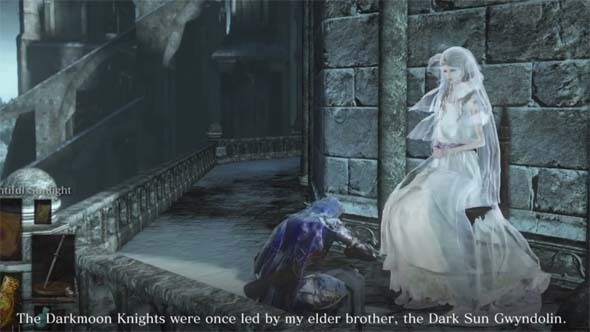 Or at least, she tells us that her father is Gwyn and her sister is Gwynevere and her "brother" is Gwyndolin. Seems pretty cut-and-dry right? OK, blog post over. If I keep writing on topics like this, I'm going to become very prolific! ... Well, maybe it's not quite that simple. This all seems rather fishy, and I'm not so sure if I'm willing to take Yorshka's words at face value. 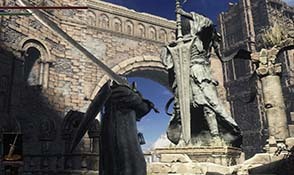 We still have the Ringed City DLC coming out for Dark Souls III at the end of this month, so it's entirely possible that DLC will settle the questions raised in this post. But until then, please humor me as I take a dive down a bit of a rabbit hole. Yorshka directly states that Dark Sun Gwyndolin is her brother. Then I place thee under the aegis, and the power, of the Darkmoon." 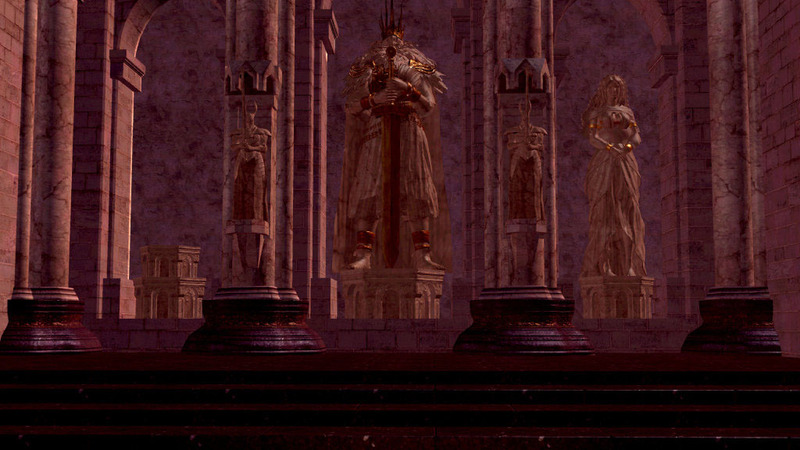 "The Darkmoon Knights were once led by my elder brother, the Dark Sun Gwyndolin. But he was stricken by illness, and leadership of the knights fell to me. Then Sulyvahn wrongfully proclaimed himself Pontiff, and took me prisoner. Oh where could my dear brother be?" 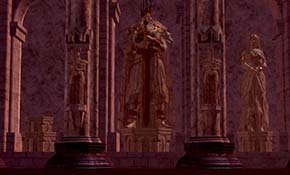 A couple years ago, I posted about a burning question in Dark Souls' lore: who is the "forgotten" god of war (first-born sun of Gwyn) who was expunged from the annals of Anor Londo? At the time, the leading theory was that Solaire was intended to be the firstborn god of war, and I tentatively went along with that interpretation. There were a few holes in the theory, a lot of it was circumstantial, and there were even a couple of alternative possibilities. 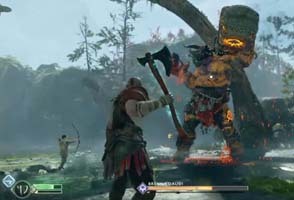 I also wholly admitted that it was very likely that the god of war character simply wasn't present in the original game, except through the lore references in the environment and item descriptions. Dark Souls II did little to answer this question, other than to provide a possible name for the god of war: Faraam. Well, it turns out that Dark Souls III finally answers this question, and all of us who thought it might be Solaire were totally wrong - and may even look foolish in retrospect. 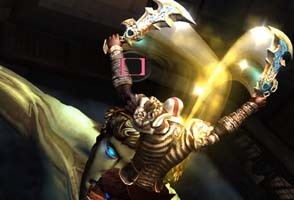 As is so often the case with Souls games, you'll have to work hard to find all the good lore. 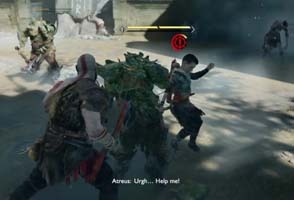 In this case, you'll need to find and conquer the optional Archdragon Peak area of the game, which, itself, requires that you find the Untended Graves optional area as well. 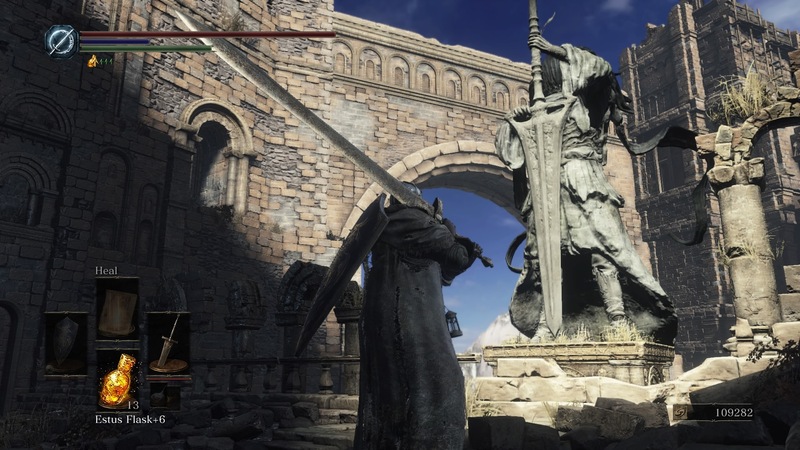 These statues of the Nameless King resemble the statue and pose of Gwyn in the first game. 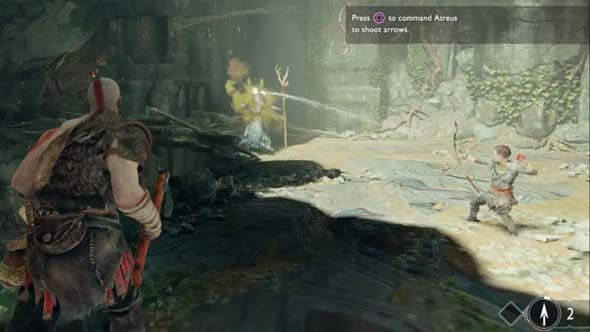 Once you make it to Archdragon Peak, you'll be treated with a large, sunny area populated with serpent men that should look familiar to veteran Dark Souls players. I'm still unclear regarding the lore behind these enemies. The original man serpents from Dark Souls were hybrid creations of Seath's experiments. Perhaps the man serpents in Archdragon Peak are the progeny of the original serpent men from Sen's Fortress. 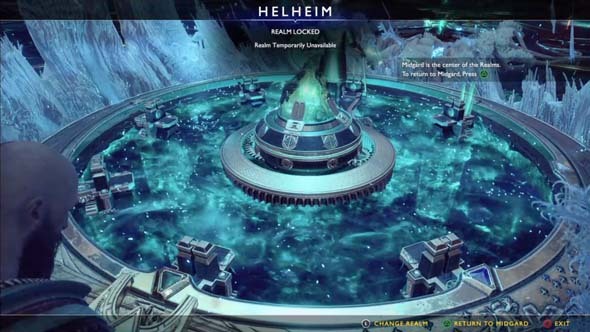 More importantly, however, is that Archdragon Peak is also home to the Ancient Wyvern and the Nameless King.